WHAT'S A PARTY WITHOUT ART? If you want to do something different and exciting for your child's next birthday party, celebrate at the Taubman Museum of Art! Birthday parties at the Taubman are designed for children ages 2 to 14 years old. They last for 90 minutes, including hands on art experience in a private studio classroom and time in Art Venture, our hands-on interactive art gallery for children and families. 60 minutes in private studio/classroom. A dedicated Children’s Education associate who will stay with you throughout the party and lead the art activities. Sketchbook party favor for all children attending. A Special gift for the birthday child, a “Happy Birthday” canvas painting to be decorated by all attending. Time for cake and presents after time in Art Venture. 30 minutes in Art Venture. Art Venture is an innovative exploratory gallery for youth and families. 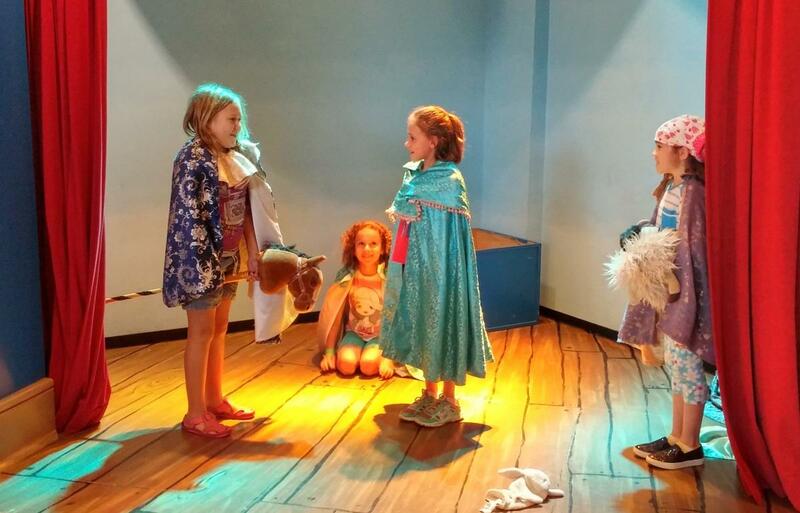 Visitors to Art Venture can paint, draw, build, connect music with art, investigate 3D printing, create sculptures, display artwork, dress up in costumes, put on puppet shows, and much more. *Please note: Art Venture will be open to the public. Decorate your own art aprons and paint a masterpiece on kid friendly easels! Calling all kings and queens. Dress up in your own crown and create your own magical sword or wand! Activities vary. Ask us about any seasonal themes we are offering! These will connect to current exhibitions. Please note: Once a theme is finalized, it may not be changed. Birthday Cake - No candles; please see booking information below. Decorations - Our classroom is used for many events and we have artwork and posters on the walls, but you may bring tablecloths, banners, table decorations, etc. if you wish; see booking information below. Birthdays parties require a minimum of 10 participants and a maximum of 20. A deposit of half of the party cost will be due at the time of booking. There is no additional charge for materials. Adults are free. One adult is required per 5 children. Under no circumstances may a child be dropped off unescorted at the Museum entrance. If you are not a member, sign up for a family membership when you book your party, and you will enjoy additional membership benefits for the rest of the year! It is recommended that you book your party at least 3 weeks in advance to secure your preferred date and time. Prior to making a deposit, a date may be held for no more than 24 hours. Once a deposit is received, the date is reserved. Certain dates may be unavailable due to holidays or the scheduling of other Museum programs. Cancellations must be made 14 days prior to the day scheduled to receive deposit refund. Parties begin promptly, and unfortunately, the party time cannot be extended if party participants show up late. Free or discounted admission passes, coupons, and promotions cannot be used for birthday parties. To protect the art and the Museum, the following items cannot be used: balloons of any kind, candles, propane, and confetti. In addition, the children’s creations from the hands-on activities help create a festive atmosphere. If you would like to bring in additional decorations, please confirm in advance. In the event of inclement weather, you may call ahead to reschedule your birthday party at no extra charge. If the museum closes on the day of your party due to unexpected weather, you will receive a full refund and may reschedule your party if you wish. BOOK YOUR PARTY NOW! Contact Alison Lee, Education Coordinator, at 540-204-4101 or alee@taubmanmuseum.org.